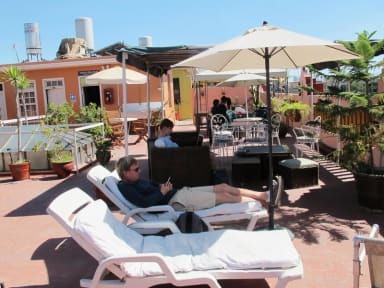 Park Hostal i Arequipa, Peru: Reservér nu! The city of Arequipa was declared a “World Heritage Site” by Unesco in 2000. It is the capital of the Department of Arequipa, also known as “la Ciudad Blanca” or “White City”, due to its numerous and magnificent constructions, such as temples, convents, mansions, and palaces, built with white volcanic rock (sillar). Our guesthouse is a large colonial house, specially remodeled to offer you a friendly service for a most relax and enjoyable stay. Our rooms offers, -Our prices include breakfast and all taxes. -With the exception of the dormitories, all our rooms come with a private bathroom and cable TV -Prices are stated at an approximate exchange rate, and are subject to change. We have single , double, twin, triple, quadruple rooms with private bathroom, tv cable and hot showers 24 hours. Dorm for solo travelers. - Tourist information and tours from our own on-site travel agency. - Speakers in your room to plug your Ipod or Mp3. - Large terrace with view of downtown and surrounding volcanoes. - Baby Football and other games.